You can do it. Your birth name is not Mr. President after all, it is Laurent Gbagbo. And as an ex-president you are still entitled to a relatively long limousine. Yes there’ll be fewer toys on offer, less pomp, no sirens… but you certainly won’t be destitute. Indeed, Laurent, it may surprise you to realise that due to the scarcity of African ex-presidents (your colleagues – for some reason – prefer to retire to mausoleums) you may be in a position to commence a lucrative career on the international circuit as a much fêted public speaker. But you have to hurry. The window on the ‘fêted’ bit is closing fast, especially if you provoke another crisis in that long-suffering nation. You should know that presidents who precipitate unnecessary war and bloodshed are no longer as hot as they used to be. Tony Blair can barely walk an English street these days, how much more speak in a British bookshop. Your permanent address is not Abidjan’s Presidential Palace, Laurent. I know you have been there since 2000, but egos are pretty elastic things. However large it may seem right now it will fit snugly into more modest accommodation. The relocation of an ex-president is not the end of his life. There are metropolitan examples of this and you are welcome to look north to France as usual. Valéry Giscard d’Estaing was rejected as President of France at the 1981 polls. After the dizzying spendours of the Palais de l’Élysée, in 1995 he returned to local concerns, campaigning for election as mayor of Clermont-Ferrand. Sadly he lost that election. But neither the shame of standing for humble office nor the humiliation of losing it killed d’Estaing – and that is the moral of this little anecdote. So steel yourself Mr. Ex-President. You can do it. The blood of the thousands of your compatriots spilled in the last war cries onto you. Heed those cries, Sir. Remember that sacrifice of life, of limb. Remember your public tears of contrition. Go on, put a brave face on it: you have not lost an election, you have saved a motherland onto new generations. Sacrifice a few presidential toys and pour out a short and gracious Concession Speech. Retire temporarily, for the sake of the people you love. And if you have no taste for the international lecture circuit, perhaps a grassroots public service position in the northern regions of Cote d’Ivoire. Throw yourself into a local concern in the so-called heartlands of your opponent and see if you would not have melted the intransigent ethnicity of Ivorien politics by the time the next Presidential elections come around. (Don’t worry, we’ll be here to see that Alassane plays fair…) And if all else fails, there’s always the Mo Ibrahim Prize for leadership. I can’t promise anything – you know they didn’t find a worthy enough winner last year – but they can’t keep making excuses forever. People might begin to think they’ve gone broke. 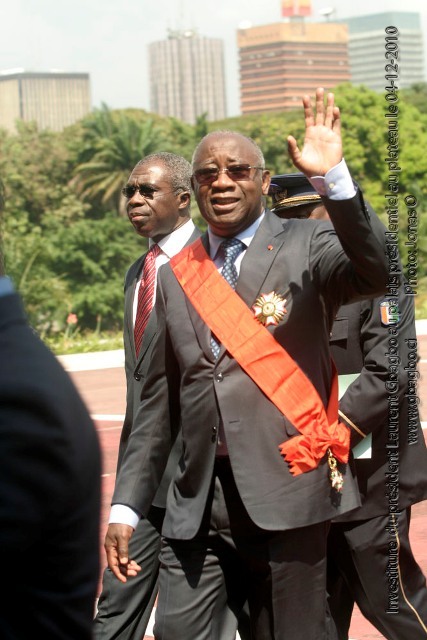 I am rooting for you, ex-president Dr. Laurent Gbagbo. PS: I hear the Nigeria-led ECOWAS might dispatch peacekeepers to maintain your status quo and that Mbeki is visiting on AU’s behalf to mediate… here’s a warning from history: back in the day, Nigeria-led ECOMOG troops did not much extend the life of Ex-President Samuel Doe, or his government. And do tell Mbeki that AU should get out of the crisis-management mode and set up orientation programmes and employment bureaus for retiring heads of state. Not for you of course, but Mbasogo has ruled Equatorial Guinea for 30 years and Gaddafi, Libya, for 40 years… O dear. I have not just ruined my appeal, have I?